‘I have learnt to respect the dignity of difference and have become enriched by meaningful dialogue’. ‘We have been sensitized to the prejudices which still exist in our society’. ‘We have learnt to respect people from different religions, cultures and backgrounds’. ‘There are so many things we can learn from one another through having meaningful dialogue and I have also learnt so much more about myself’. ‘I have learnt not to make assumptions about people and judge them by the way they look’. ‘I have changed the way I look at the world and I am a far better person’. ‘I understand the importance of helping people in need and not remaining silent when others are treated unfairly or unjustly’. These are some of the remarks delivered by learners at a reception hosted by Deputy Mayor, Ian Nielson. 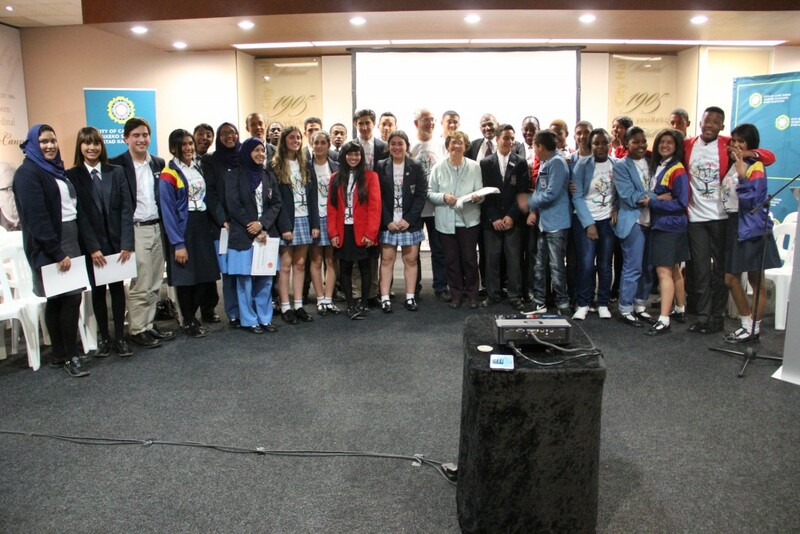 The learners – from Gardens Commercial High School, Herzlia High School in Highlands Estate, Langa High School, Oude Molen School of Science and Technology in Pinelands, Rylands High School, The Leadership College in Manenberg, and Spine Road High in Rocklands – had all been participating in an Interfaith Intercultural School Twinning and Exchange programme organised by Marlene Silbert with the assistance of Steven Jacobs under the auspices of the Cape Town Interfaith Initiative (CTII). Marlene Silbert’s house was used by the ANC as a safe house to shelter people sought by the apartheid government and Marlene, as a former teacher and the founding educational director of the Cape Town Holocaust Centre, realised the truth in Mandela’s words, and how essential it is for young South Africans to unlearn the culture of racism and prejudice that had developed over the centuries and developed a programme for high school learners called, ‘Learning to Live Together: we can make a difference’. 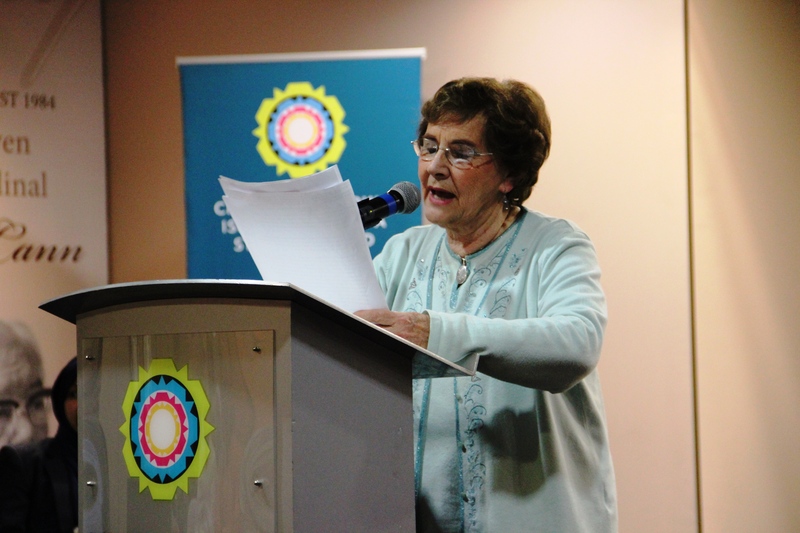 After being elected to serve on the CTII, Marlene developed a similar programme which involved selecting three learners each from fiveschools from different areas who came from different religious, racial, socio-economic and historical backgrounds. The results surpassed all expectations, and Marlene was invited to facilitate a similar programme in Blackburn in the U.K which was funded by the Blackburn College. Even when the funding for the overseas trips ceased due to financial difficulties, the programme continued to expand in Cape Town now involving four learners from seven schools – and the results, both according to the teachers and from the learners themselves, have been remarkable and transformative. Afternoon sessions were hosted by the different schools which focus on getting to know one another, eliminating stereotypical assumptions, respecting people from different backgrounds, developing an appreciation of diversity, enhancing self-esteem and empowering them to become social activists, to work towards transformation and help people in need. The students introduce clubs within their school, twin with other schools and introduce community projects. There are also two weekend camps which deal with character building, respect for themselves and others, self-discipline, problem solving and leadership. 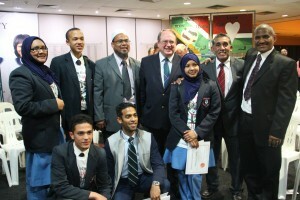 Learners and teachers from the Leadership College, Manenberg, with Deputy Mayor Ian Nielsen, and CTII Chairperson, James Ellman. Within two sessions the barriers break down as these young people begin to bond and discover how much they all have in common. As one learner said, ‘Without our meaningful discussions we would never have been able to form such wonderful relationships’. During the second year of the programme, the pupils, who are then in grade 11, tutor disadvantaged young learners in numeracy or literacy through the Amy Biehl Foundation. The learners find this so rewarding that when the sessions end, they often volunteer to continue tutoring, or through their school, find another school where they can continue to tutor disadvantaged learners. The course is life changing and all these future leaders comment that it is a pity that it is not possible to extend it to every young person in South Africa. 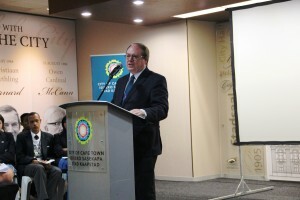 Deputy Mayor Ian Nielsen praised the programme saying that Cape Town was unique because it was a city of minorities with a great deal of diversity. This provided opportunities, such as those taken by the CTII to reach out and build links to develop a new future – one in which we should not rely on race or religion. ‘Don’t let race speak for you. Don’t let it set the agenda’, he implored.